Kidz Bop 27 CD Giveaway! Fine Print: I was given a copy of the CD for review and Kidz Bop is giving another to a reader. All opinions and statements below are my own. This album was a little bit different from our past experiences because we knew the entire first half of the album and didn’t know any of the songs on the second half. They are all good songs, but my kids were a little bummed out that they didn’t know as many as they had on previous albums. That said, the first eight songs are some of our favorites! The songs are appropriate for your child’s ears and you’ll be able to enjoy music that you both dig and that know are okay for them to listen to. 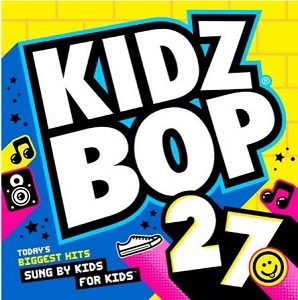 To get everyone excited about this new album, I am giving one lucky winner a copy of the Kidz Bop 27 CD! To enter this giveaway, complete any or all of the options listed below. Giveaway ends 2/6. Good luck! My special-needs little Sweetie would love this! Say Something or Cool Kids! My kids would absolutely love this! They love all of these songs! Thanks! My three year old daughter begs me for this every time the infomercial is on. She loves All about the bass. Our favorite song is All About That Bass. Shake it Off is our favorite!